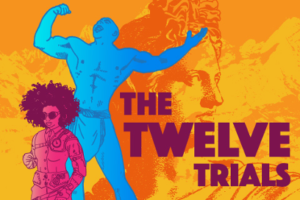 Face off against some of the greatest heroes of your age when you are called by the gods to participate in their twelve trials. Coming from humble origins, and hailing from a tiny farming village, you will have to prove yourself worthy of godhood. It’s 33% off until October 4th! The Twelve Trials is a 160,000 word interactive fantasy novel by Douglas DiCicco, and won third place in The Choice of Games Contest for Interactive Novels. It’s entirely text-based—without graphics or sound effects—and fueled by the vast, unstoppable power of your imagination. • Defeat dragons and other monsters through brawn or wit. • Romance a giant, a queen, a muse, and many others. • Lead a revolution in an oppressed island. • Find hope for starving villagers in a remote colony. Douglas DiCicco developed this game using ChoiceScript, a simple programming language for writing multiple-choice interactive novels like these. Writing games with ChoiceScript is easy and fun, even for authors with no programming experience. Write your own game and Hosted Games will publish it for you, giving you a share of the revenue your game produces.